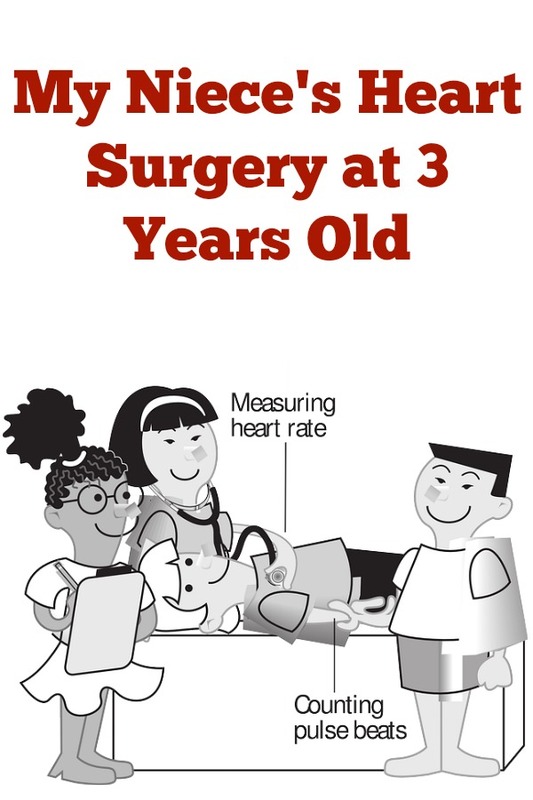 When my oldest niece Unique was just three years old, she had to have heart surgery. She had to have a valve widened. The problem was discovered at a routine checkup when the doctor listened to her heart. She was lucky that the problem was caught before it caused any problems. I asked her (she’s now a young adult) and her mother what they remember or what jumped out at them about it. Her mother remembers being scared that she wouldn’t make it through, that she wouldn’t be all right. The surgery took 3 hours and Unique was up and walking around only 3 hours after that. What a trouper! Little Unique was more upset about the needles than when they took out her chest tube, dripping with blood. Luckily it was determined that her condition was not related to any genetic component. Unique doesn’t remember much as she was only three. Just bits and pieces like waking up a bit from being sedated and feeling pain from what they were doing and then they put her under more. She remembers them pouring water over her to make her empty her bladder before the procedure. She remembers when she was older, finding two scars in her leg from where an angioplasty was done and asking her mom what they were from and why there were there. She has a long scar in the middle of her chest and perhaps because she’s had it for so long, she doesn’t mind it all. She likes that it starts conversations and she doesn’t mind explaining what happened. She isn’t afraid to show her scar and I’m proud of her for that. Unique’s heart surgery may not have been related to a family history of heart disease but that doesn’t mean it wasn’t there. Both of my in laws struggled with heart disease. My mother in law pass away in 2006 from her second heart attack and my father in law had over 30 heart attacks and 4 heart surgeries in his lifetime. My husband remembers these surgeries and how it affected the family. That fighting spirit of Unique’s must have been passed down to her by her Papa because he was laying down scrubbing floors after his first surgery, when he was supposed to be resting. I hope my husband’s family never has to endure a heart surgery again but if they do, I hope it is a minimally invasive heart surgery and they all take a page from Unique and are proud that they made it through. Have any of your family had heart surgery?